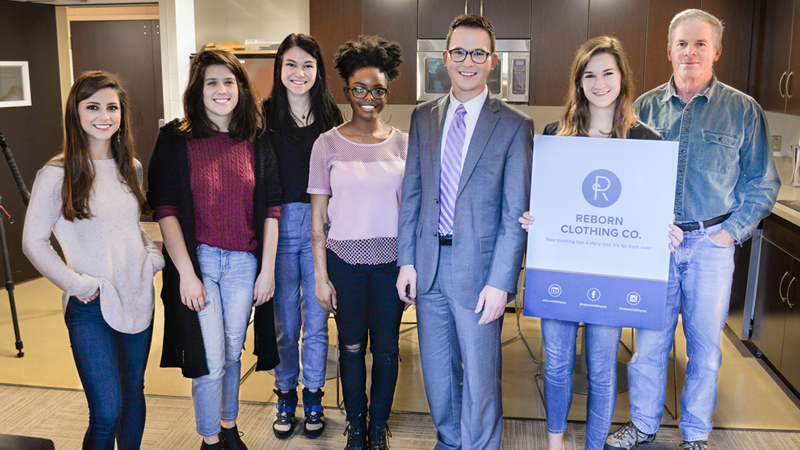 WRAL News Features Student Company ReBorn Clothing Co.
“Your clothing has a story and it’s far from over,” reads the homepage of newly-launched Reborn Clothing Co.’s website. NC State student Emily Neville (College of Humanities and Social Sciences) founded Reborn to make sustainability personal by transforming meaningful garments into usable, everyday products. Neville and a team of four designers from the College of Textiles recently spoke with Brian Shrader from WRAL News. In the interview, Neville says the idea is the incorporation of something she’s been doing for years with items in the back of her closet. She recognizes the need for trends that reduce textile waste, which has doubled in the U.S. over the past 20 years. Holding tightly to the ideal that people “vote with their wallets,” Neville is determined to cast her vote for sustainability and to create a business that encourages others to do the same. In early November, Reborn Clothing Co. hosted their official launch party and provided guests the opportunity to bring their garments of nostalgic value and meet with Reborn Clothing Co.’s team of talented designers. The NC State Textiles student designers made plans to transform their guests’ precious items: a favorite pair of jeans destined to be a laptop case or a dress awaiting conversion into a trendy makeup bag. Just like that, they were in business. The team frequently works out of the Entrepreneurship Garage, a venture creation and prototyping space located on Centennial Campus. Watch the interview from WRAL.